ArtFire Chainmaille Guild: Presenting Little Metal Merchant! We are back again with another ArtFire Chainmaille Guild member feature. This time around it is another new member, Little Metal Merchant. Let's see how they answered our questions. I started in the middle of last year(around June 2009) after my attempt at ceramic jewelry pretty much sailed the fail-boat. I wasn't happy with what I was making, it was messy and I just didn't like doing it after a while. Wanting to keep to making jewelry, I tried to think of what I really liked and wanted to do and remembered how much I liked the type of Jewelry at Renaissance Faires, bought two how-to books, ordered my first set of rings to start out with and the rest follows from there. I love how the weaves look and you have so many different options to work with. 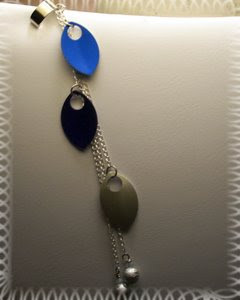 It can be made for everyday wear or for special/formal occassions. And I've always been a fan somewhat of chains, especially styles that borderline a punk/goth look. 3) What is your favourite type of ring? Stainless Steel all the way! I'm harsh on my stuff and the metal doesn't need any special care like sterling silver does so it's just perfect overall and I find it useful for other things. I fixed a tank top with them..hehe. Not so much I don't know the 4 in 1 weave but it bothers me I can't get the hang of it. For what takes me three hours to do a simple rubber/steel 4-1 bracelet, I could have a dragon scale cuff finished. 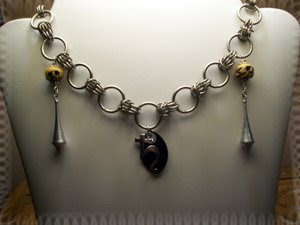 The one I recently made with the charm of Saturn, skulls and drops. I write and wanted to do a necklace with one of my characters in mind. The character is a reaper and the setting is near future, post apocalyptic so I wanted something to reflect those elements. I love how it turned out and was pretty close to how I planned and designed it originally. Definitely go for it. There's loads of tutorials online and some good books out there to self teach yourself. The Ring Lord's site is extremely helpful in types of metals, gauges and whatnot. If you decide on working with stainless steel rings, get two heavy duty pliers and fingerless padded gloves. Those rings mean business and after a while it takes a toll on your hands. Thank you very much for answering our questions, it is a great way to get to know fellow maillers. You can see even more of Little Metal Merchant's creations in their ArtFire studio. Presenting the ArtFire Chainmaille Guild.